In 2009 I reported from Puglia, the southerly region that forms the ‘heel’ of Italy’s boot-shaped outline, where I had spent a week judging wines at the Radici Festival. The festival puts the focus on native grapes, and I was honoured to be invited back to judge at the Radici competition again this year, spending three days in Puglia judging wines made from varieties including Negroamaro, Nero di Troia and Bombino. Information on the Festival, as well as a full list of this year’s winning wines, can be found on the Radici Festival website. I also found time to visit Manduria, stronghold of another of Puglia’s most important indigenous grapes, Primitivo. Though rarely planted outside the region’s boundaries, Primitivo is the best known of all of Puglia’s varieties, because of its close genetic ties to California’s Zinfandel. This discovery by The University of California a decade ago led to a flurry of excitement, and even to some producers in Puglia applying – successfully – to be allowed to label their wines as ‘Zinfandel’. It is fair to say that the most serious and dedicated producers would never dream of re-naming their native grape as Zinfandel: they are immensely proud of Primitivo, and perfectly willing to let it fight its own corner. On this visit, I took in three of Primitivo’s most passionate advocates, but in three very different operations. Each is determined to save the extraordinary bank of old-vine Primitivo that has been disappearing fast in Puglia. 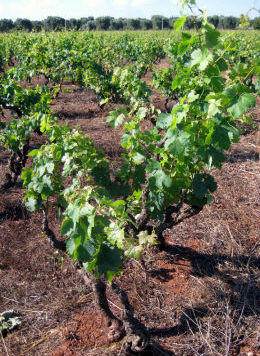 These vines, many 50 years old and more, are trained in the Alberelli system: free-standing bush vines that develop a hardy, drought-resistant character, but which are much harder to work than wire-trained vines. Right, the 60-year-old Alberelli vines at Morella. 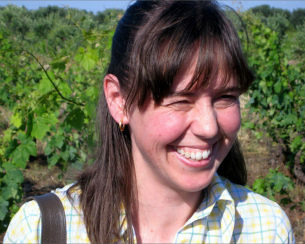 Lisa Gilbee is not your typical Pugliese winemaker. An Australian citizen, Lisa trained at Roseworthy as a winemaker and worked for Capel Vale in Margaret River before setting off to Italy, where she travelled and worked in various regions. Ending up in Puglia, she fell in love not once, but twice. Her first love was Gaetano Morella, son of a vineyard-owning family, and her second was the old bush vine Primitivo which at that time disappeared into tankers bound for anonymous blending. “It was criminal,” says Lisa. Today Lisa, Gaetano and their two small kids blend their business (Gaetano looks after the vineyards) with an environmentally-conscious lifestyle. “We treat it like a really large hobby that is also our passion,” Lisa tells me, “so we can take our time and make decisions that suit us.” One decision they have followed from the outset is to farm organically, and latterly, Biodynamically. “My vines might look uncared for,” says Lisa, “but that’s part of the philosophy.” She goes on to speak of the incredulity expressed by the young winemakers from Australia who come to work with her most vintages, when faced with these straggling, wild looking vines. Morella’s first vintage was 2001, with a parcel of 70-year-old Primitivo, but since then they have purchased other small parcels. The couple have also planted new vineyards, but with other varieties including Fiano, not Primitivo. Lisa says that if they want more Primitivo she will only ever buy old bush vine plots, not plant. Clearly preservation of this wonderful material lies at the heart of the Morella philosophy. Morella is sold in the UK by Berry Bros & Rudd. See all stockists on wine-searcher. Lovely nose, with a fine quality of French oak, and very deep-set Morello cherry and black chocolate notes, beautiful impression of natural concentration. Lovely depth on the palate too, retaining some bite and lift, and juiciness in the finish. 92/100. Lots of cedar and sweet fruit here, a touch of raisiny quality, and seems quite light on the palate, and doesn’t have the depth or structure of the 2005 or 2007. 89/100. Smokier, more mineral character somehow, with dusty red and black fruits that are very appealing. A sense of bloody ripeness beneath. The palate has a leaner character too, the sinewy character of the tannins and a very pure seam of fruit. This has a delicious edge that runs through it, the acidity and supple tannins playing against the purity of the fruit. Dry and savoury, but charming too. 93/100. The oak takes a further step back in this vintage, adding just an incense-like fragrance, lovely freshness and bite with a cherry ripeness and fine graphite quality. Lovely racy mid-palate and fine, supple tannins on the finish, again dry but charming. 92/100. A very hot but rainy vintage, and there is a touch of raisin quality, but the plush sweetness of the fruit comes through, wrapped in a swirl of smoky cedar but deliciously ripe and intense. The acidity holds on well here too, leaving the finish pure and well-balanced, and really delicious again. 91/100. Delightful spice and smokiness here again, and a definite impression of dusty, cedary character. The fruit has beautiful definition, and the balance is lovely: tannins seem very fine, and there’s a delicious finesse and harmony here. Drinking beautifully. 93/100. This was my second visit to see the excellent ’boutique’ operation at Attanasio, though last time had been to their immaculate little cellar in the centre of the city of Manduria. Here, I met up again with Luca Attanasio in a Primitivo vineyard first planted by his family in the 1920s. 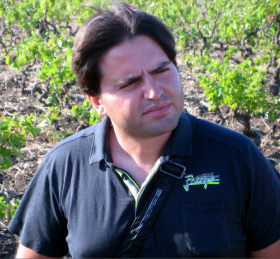 Luca (pictured) is in charge of vineyards and cellars, whilst his brother Alessandro looks after administration. Their father, Guiseppe, still works in the vineyard at the age of 74. I asked Luca about gaps in the free-flowing, but dense formation of bush vines, and he explains how in the 1960s people tended to replace dead bush vines with French hybrids that were easier to grow and yielded much higher quantities of fruit. Attanasio (and Morella) have simply removed these for now as they did not want them in their ferment. It appears there are currently no UK stockists of Attanasio’s wines, but see international sellers, some of whom offer UK delivery, on wine-searcher. Dusty blue/black fruit quality. Lots of black plum and cherry juiciness. Tiny touches of clove and some delicate herbal notes in a really quite refined style. Promising. 91/100. Beautifully smoky, cedary, very solid fruit quality, lots of glossy depth. The palate is attractively deep and rich too, with a glycerine richness and a full, solid oak underpinning, but not at the expense of the plush, chocolaty fruit pushing through. A slightly more glossy, modern style than the 2006 Morella, but delicious. 92/100. Again, the oak is nicely integrated here, but that fine smoky cedar quality is still there. The fruit is fantastic, quite thick, rich and concentrated, but has great depth and natural concentration. Beautiful stuff. 93/100. There is plush, ripe, silky fruit and a silkiness to this on the nose, with a chocolaty ripeness and density. Very plush, but the fruit concentration is excellent. Sweet and full, this has great structure for a moderate vintage and a long, pure finish, with plush oak filling in beneath. 92/100. Seems really quite light, creamy and breezy on the nose, with cherry ripe aromas and a similarly bright, ripe, black cherry fruit that is super intense and super sweet, but still has that creamy, up-front charm. This seems not to have the same structure as the 2005 or 2006, but is a lovely wine. 90/100. As a complete contrast to the two small, family-owned and run estates of Morella and Attanasio, my last visit in Manduria was to the large and very progressive cooperative cellars of San Marzano, whose flagship Primitivo wine ‘Sessant’Anni’ picked up a top award in the Primitivo category of the 2010 Radici competition. The Cantine San Marzano was founded in 1962, with its cellars geographically in the centre of Manduria. It is composed of 1,200 growers, and the modern, very well-equipped Cantine shares the same mission as Morella and Attanasio to preserve and celebrate the old bush vine Primitivo in the area. To that end they are trying to buy up old bush vine plots as they come on the market. 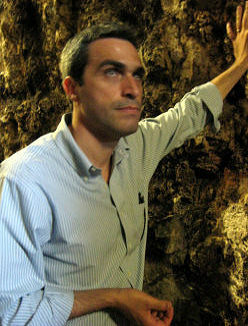 The Cantine’s director Mauro Di Maggio (left, pictured deep in the subterranean cellars) told me they are also investing heavily in trying to produce truly crisp, refreshing white wine styles too, because the Salento peninsula is not known for this style, but he believes is it possible, particularly with the Minutolo grape. San Marzano’s wines are with Astrum Cellars and Liberty Wines in the UK, but are quite widely available. See all stockists on wine-searcher. An IGT wine made from the highly promising Minutolo grape. Ripe pear fruit, a touch of herbs. A little touch of honey and lemon too. Quite pleasantly fresh on the palate. Though not particularly distinctive, this has a nice apple tang and a bit of real zip in the finish. 86/100. From dry, hot clay soils, this is matured in French and American oak for 5/6 months. A little bit of coffee bean oak, but the cherry and floral-tinged fruit comes through. Quite bold and juicy. The palate has huge sweetness: lots of dry extract creates a slightly cloying character, with very dry tannins too. Concentrated and impressive in its way, but lacks a touch of elegance. 86/100. From old bush vines and selected vineyards on terra rossa soils, rich in iron oxide. Big, ripe, bloody nose: lots of gamy richness to this, and much more character. Plenty of oak (12 months in French and American), but this soaks it up better than the Primitivo ‘Sud’, with an undeniable opulence on the palate, the intense, almost raisin sweetness pushing through, with a liquorice twist adding grip to the finish. Big, plush and opulent, but the finish does not dry in the same way as the ‘Sud’. 91/100. Where can I buy Feudi di San Marzano wines in Ireland?